Washington, D.C. – March 26, 2008 – With less than a week to go, participation in Earth Hour (www.earthhour.org) has grown dramatically as nearly 200 cities, including 35 in the U.S., join millions of individuals and businesses around the world in turning off their lights on Saturday, March 29th from 8 – 9 pm local time in a dramatic symbolic gesture in support for action on climate change. Activities in support for this global issue will roll through virtually every time zone, with participation in: Bangkok, Brisbane, Buenos Aires, Christchurch, Copenhagen, Dubai, Dublin, Fiji, Halifax, Manila, Montreal, Niagara Falls, San Juan, Scott Base (Antarctica), Sydney, Tel Aviv, and Toronto. A full list can be found at www.earthhour.org. 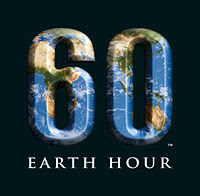 In the United States, Earth Hour is being celebrated coast to coast including the flagship cities of Atlanta, GA; Chicago, IL, Phoenix, AZ; and San Francisco, CA; as well as supporting cities Charlotte, NC; Denver, CO; Honolulu, HI; Miami, FL; Minneapolis, MN; Pittsburgh, PA and St. Louis, MO and in smaller U.S. cities, such as Arlington, VA; Columbia, MO; Homer Glen, IL; La Grange, TX; and Norman, OK. In each of these cities, individuals and businesses are creating events to engage, enlighten and spread the message that together, each one of us can make a difference on this global issue. The global organizer of Earth Hour, World Wildlife Fund (WWF), is encouraging participants to celebrate the evening with unique, environmentally-friendly activities. From restaurants hosting Earth Hour candlelight dinners and nighttime hikes with park rangers in San Francisco, all the way to glow-in-the-dark ultimate Frisbee at the Illinois Institute of Technology in Chicago, people are finding creative ways to celebrate Earth Hour and reduce their carbon footprint while going about their daily activities. In Chicago, one couple even plans to hold a candlelit wedding reception to celebrate the event. Earth Hour’s National Partners Hewlett Packard, Esurance and National Geographic Channel, as well as other supporting corporations including The Coca-Cola Company, CBS Outdoors, Clear Channel, Cox Communications, The Weather Channel and others have donated their time, products and services to help spread the word and raise awareness about this global issue. Not only are these organizations turning out their lights at many of their offices in the U.S., but they have donated several millions of dollars in advertising space in recognition of Earth Hour. The event on March 29 is one step in ongoing efforts to fight climate change. To encourage longer term benefits, all participants are being asked to replace older light bulbs with highly-efficient compact fluorescent bulbs, and to pledge to take actions to reduce their energy consumption on a daily basis. WWF stresses the importance of celebrating Earth Hour in a safe and secure environment—and is asking people to turn off only non-essential lights for one hour. All lights impacting public safety will remain on, including street lights, and lights in public spaces, hospitals or emergency services remaining on for the duration of the event. More information about Earth Hour and ways to get involved can be found at http://www.earthhour.org/. Earth Hour got its start last year in Sydney, Australia, when more than 2 million people and thousands of businesses turned out their lights. While power consumption dropped more than 10 percent in that single hour, the message that climate change must be slowed shone brightly. We swear - we were the only dark house in all of Tucson, Arizona!!!! We think no one here knew about it. We rather think that than imagine they were all too non caring to not participate.